All characters are created by my 5 year-old son, The Junior Partner. He has either drawn these characters on his own and I have recreated them here, or he has sat at my elbow dictating design and conceptual ideas like a creative, but frenetic, taskmaster. Shooting Star is actually a villain. A creature made from an exploding star, Shooting Star is like a cosmic Venom. 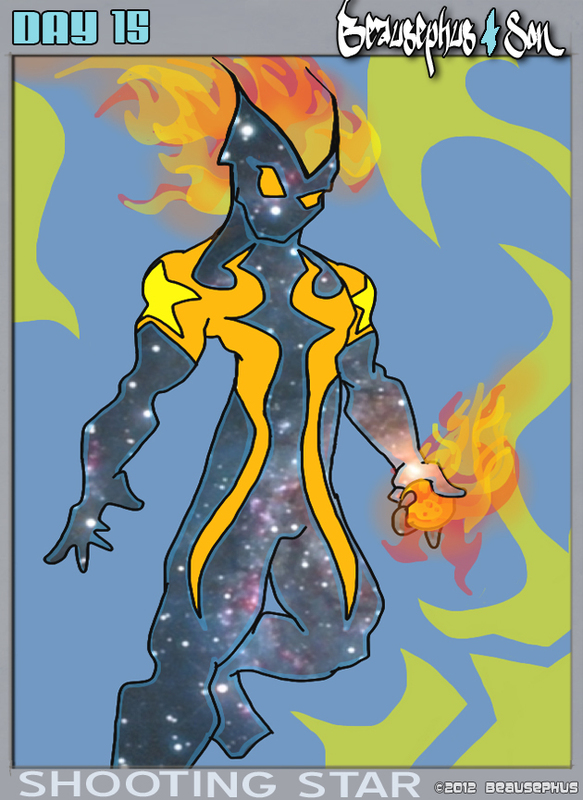 The energy possesses a human or alien or other creature and then the “firey star powers” take control. Shooting Star has the ability to fly through space and convert whatever being it currently possess into various forms of cosmic and electromagnetic energy. Shooting Star likes to create fireballs of “star energy” to hurl at his opponents. I specially like this one. So ask the JP sometime: who would win in a battle: Shooting Star or Blue Lightning? He’s cagey about villains based on his exposure to cartoons and comics. It’s okay for the heroes and “big” villains to cross over, but when he’s making stories up original characters have their own villains who never exist outside that character’s sphere of influence. The Batman Legos do not interfere with the Avengers legos. He’s very adamant about that. This character is the villain of “ROCKETMAN” who may not make it into the contest this month, but is just a guy in armor that looks like a jet…he really looks like an old Starscream Transformer, but that’s a flaw n my design. I understand. I used to eat my TV dinners the exact same way =). However, I always played the “Who’d Win?” game between DC and Marvel. I had to wait until I was an adult (legally) before I ever got to read the Superman-Spider-Man crossover. And it definitely wasn’t worth the wait.